Jimmy’s Diner is a hamburger shop with sports playing on the big-screen television (baseball or basketball depending on the season) and 80s rock music in the background. Listening to Billy Joel while enjoying a good burger and fries transports me back to my high school days and feels very comfortable. The hamburger shop is just three minutes from Kokubunji Station’s north exit on the JR Chuo Line. 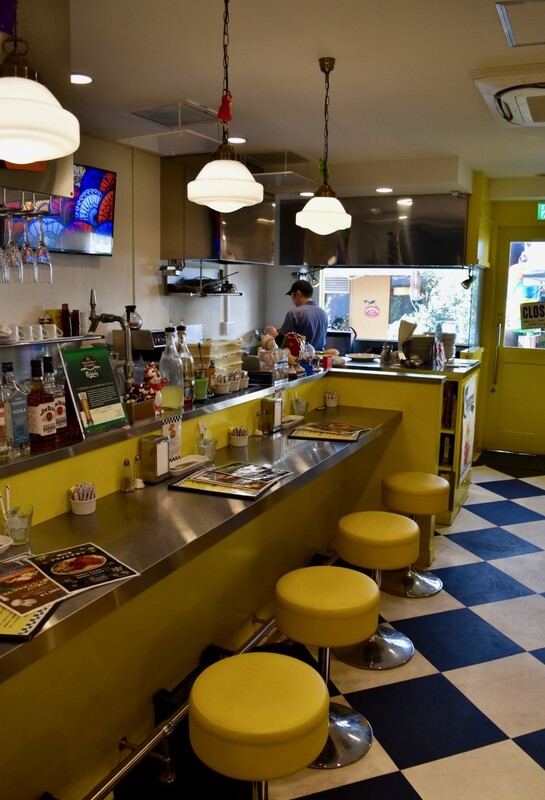 Owner Hajime Hirakawa, whose nickname is Jimmy (his host family in Australia had a hard time saying Hajime and Jimmy stuck as a nickname), opened Jimmy’s Diner a little over three years ago with his wife. 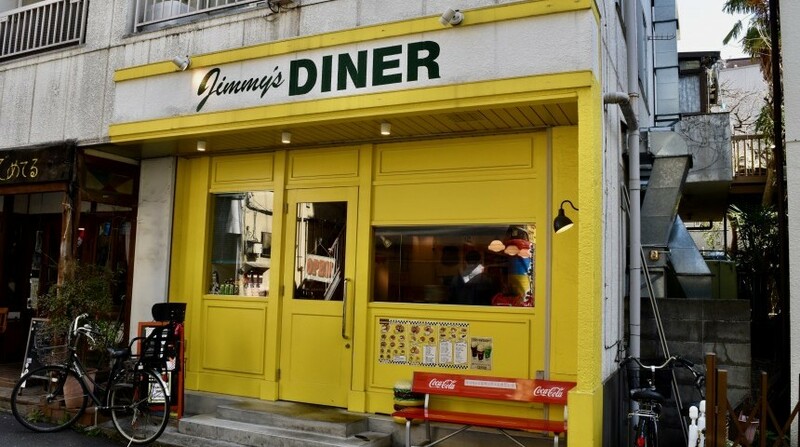 Prior to opening Jimmy’s Diner, Hirakawa worked at Sunny Diner in Tokyo’s Senju district. He jokes that at Sunny Diner he picked up two things: “the skill to make burgers and my wife, Asuka.” They take turns making the burgers. Jimmy sports vintage button-up shirts and a baseball cap while Asuka is in a short skirt with a retro bowling shirt. The warm and friendly service is easy-going. The most popular burger is the bacon, egg, double cheeseburger (¥1,580). Lettuce, tomatoes, pickles and onions complete the burger. 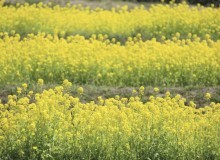 The patty is made with hormone-free Japanese beef and the buns are made at local bakery, Komerebi. Toppings that can be added include avocado, sautéed garlic, jalapeno and pineapple (¥100-150). Additional sauces include a bolognese-like meat sauce, tartar, barbecue, teriyaki, salsa or sweet chili (¥100). For simpler folks, a hamburger and French fries is only ¥1,080. The burgers come with a generous stack of thin and crispy French fries. For an extra ¥100 the portion can be increased, but the original portion is more than enough. 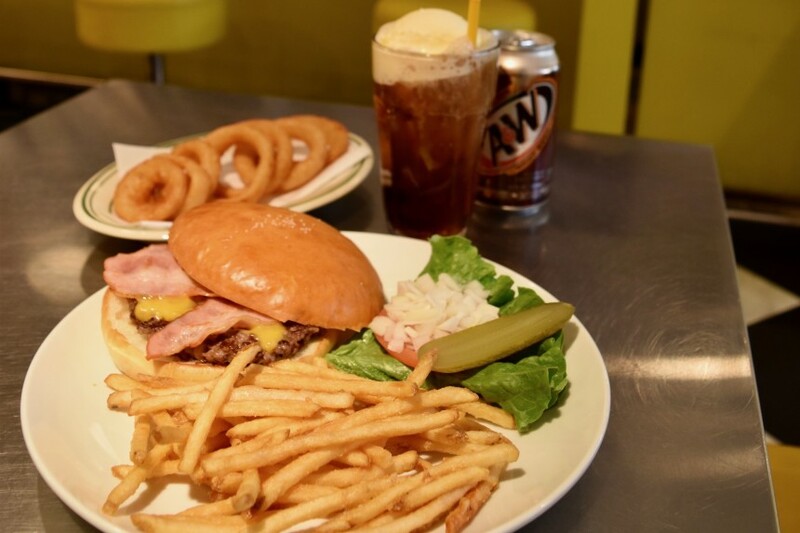 Add ice cream to your soda (¥250) to make it a float — and as an added bonus, Jimmy’s carries the wonderful A&W root beer. Lunch service includes a free beverage or half-priced beer: Carlsberg on draft or bottles of Brooklyn Lager, Laguitas and Liberty Ale SFO. Hirakawa can also make a cocktail if you prefer. The diner is bright yellow inside and out, which creates a cheerful environment. There are five counter seats and three booths. On the counter are some signed baseballs — including some from Kotaro Kiyomiya of Nippon Ham. Kiyomiya is an alumnus of Waseda Jitsugyo, which is located in the neighborhood. The customers are a nice mix of families and solo diners, young and old. It can get busy on weekends or at peak lunch times. There is a bench in front of the shop for customers to wait for their goodies. Burgers and fries can also be packaged to-go. 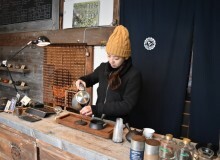 As for why he opened in Kokubunji, Hirakawa says, “there were many independently-owned restaurants in Kokubunji.” Put this shop on your radar for a post-hike reward from a day out at Mount Takao or after some shopping at Ikea in Tachikawa. It’s a burger shop that many customers would love to have on their doorsteps.